Post subject: New Horde3D blender exporter works with Beta 3? works with Beta3. I'm currently working with a Beta3 version and have trouble converting models + animations. This tool looks easy but I don't know if it will work on Beta3 engine version. Judging by the source code - no, because it uses new shader file format, which was introduced in beta 4. Use blender collada exporter, it works pretty well now. Thanks Irdis, what version of blender do I have to use? What I'm doing is converting to collada now from Blender (2.71) and then colladaconv that comes with Beta3. The animations are good but the textures are missing. As far as I remember, Beta 3 stored all textures in texture folder. So textures should be in Content/textures/<your model name folder>. Starting from Beta 4 they should be stored in Content/models/<your model name folder>. Check the exported *.scene.xml file, it will tell you where the engine wants your textures. You can also post your Horde3D_log.html here, if problem persists. Thanks Idris. Here's the screenshot and the log file. What I would also like to know is what version of Blender that works with the collada version. Judging from the log, engine loads everything just fine. One of the possible problems may be .jpg texture format, if it is compressed with progressive encoding (only baseline encoding is supported). Try to reencode your texture to png or tga and fix the suffix of the texture in your material. I was mistaken in my previous post that you should look for texture paths in your scene file. Obviously, you should check generated material.xml file. About Blender - I don't think that using previous versions would help, so the latest version is probably the right choice. Thanks Idris. The weird thing that I found is, when using the same jpg texture and this time the Blender plugin. the texture loads but my animation is messed up. Probably the blender addon does not work with Beta3? Anyway, I will try the latest version and see how it goes. Edit: I have attached the model file in question (Blend file + Collada with textures and animations) Maybe you can see what the problem is and suggest the right method. This is the last thing that keeps me from getting on to other things with Horde3D. Exported Collada file from Blender 2.77a loads fine using AssimpViewer..
For some reason the latest collada file exported by blender does not output the material file (now with 2.77a). I remember this is one of the first problems dealing with the converter program. I have tried deleting the texture and from the screenshot I posted previously above, this now has different results. It looks like it's trying to load the texture but not properly.. This is with the texture file deleted.. I have now saved all files using baseline, tried standard and optimized. 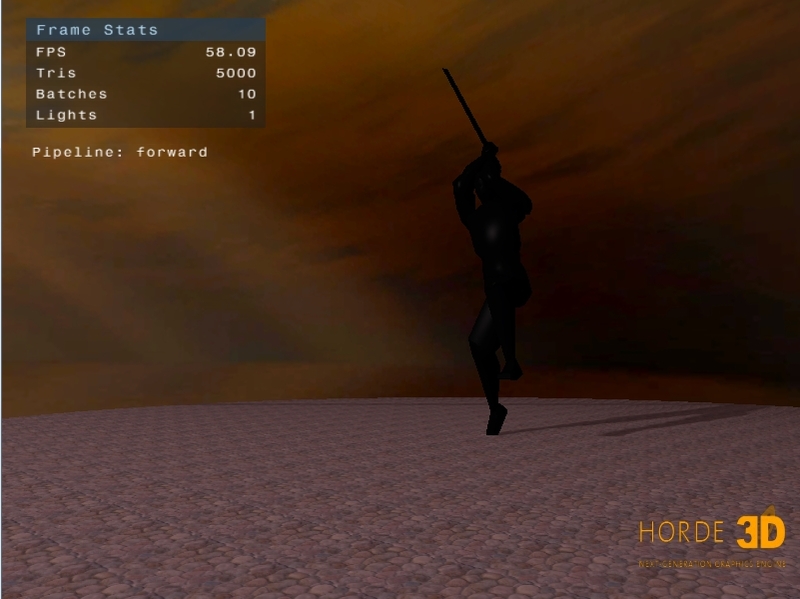 Horde Editor version 0.92 correctly displays your model (imported dae file), but it is uses beta 5. So there may be a bug in collada converter of the beta 3 version. Collada converter was originally optimized for OpenCollada exporter (Max and Maya). Ok thanks, so my simple question is, how did the man model in Chicago scene and Knight scene which has both textures and animations working properly converted to Beta 3? Can I use 0.9.2 for Beta3? 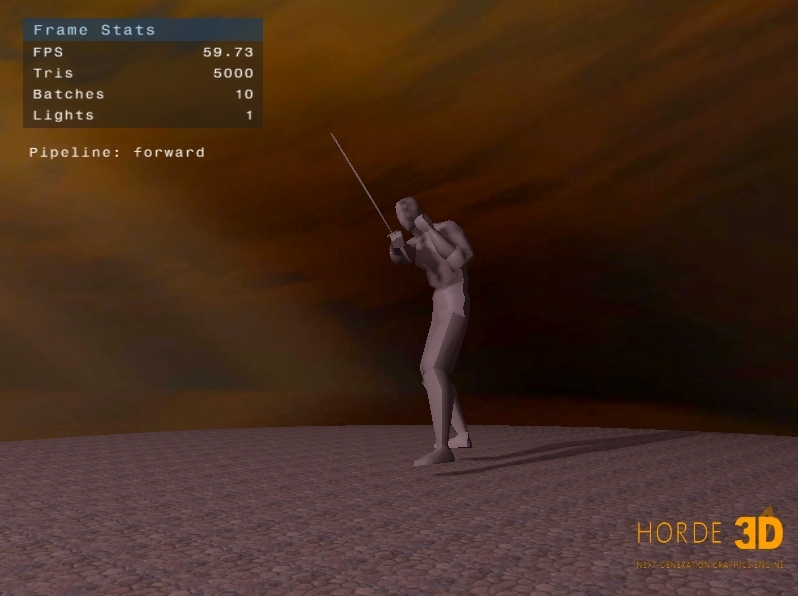 How do import models using the Horde Editor? What Max and Maya version is the ideal to use? I would like to get specifics because it's been a week now and I have not converted a fully animated textured model with Beta 3. Yes, it's kinda old but I see there's example models that comes with Beta3 and I would just like to find out how it was converted correctly. appreciate the help and time btw, thanks a lot! They were probably created with Max or Maya and exported through OpenCollada. When Beta 3 was released, Blender support was so-so (Blender did not correctly output Collada files). You can find Horde Editor here. You can try using models, converted with beta 5 converter, with Beta 3. It will most likely work, because there were no changes in formats since beta 2. Use 0.92 editor, because 0.10 is buggy as hell. In editor create new project with default parameters, probably you'll have to copy shaders folder to your new scene folder, because editor creates only "models" folder and not the others. Now Scene - add reference - import collada file. An import dialog will appear. Here you can select the file and what to convert (only model, only animation, both). After importing editor will ask the path to your texture. You can download horde beta 5 and just use the converter without the editor. 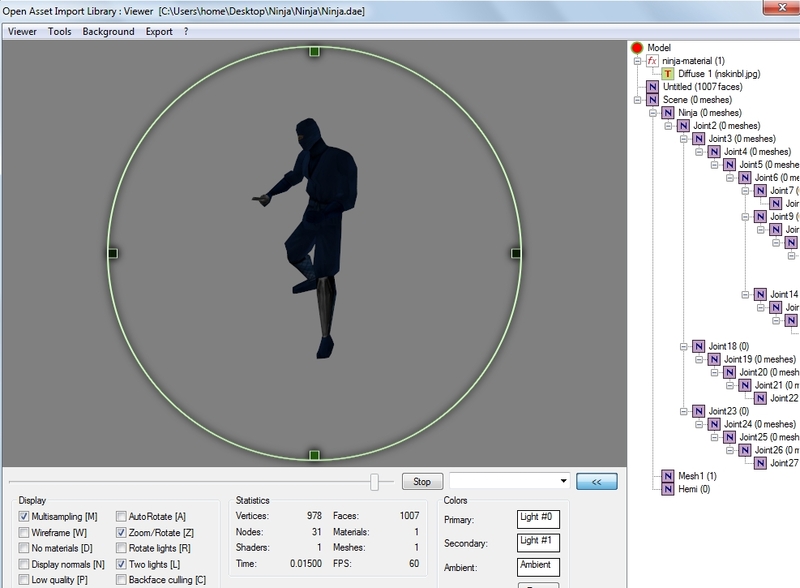 But with editor you'll instantly see if your model displays incorrectly. Note that editor cannot run animations. As for Max, I use 2013 version. You can download latest opencollada plugin from there. Just put it into stdplugs directory (where *.dle, *dlu files are and not dll). Can you load the model with animation texture with Beta 5? If so, what's the exact process? It seems that you've downloaded rather old version of openCollada. You should go to "Latest Binaries", it will take you to dropbox. There you should select max 2013 folder and ColladaMax.dle or something like that. Copy it to 3dsmax/plugins folder (it seems that it doesn't matter where it resides, it can be in stdplugs too). When does the editor crash? On startup? On scene creation? On importing? P.S. What is keeping you on Beta 3? Beta 5 or latest git has everything Beta 3 has and is more stable. API should be practically the same, or does Beta 3 still uses Horde3D::addResource() or something like that (and not h3dAddResource)? EDIT: everything works with slightly modified version of knight sample on the latest git commit from official horde3d repository. You should convert your dae model in two phases: first phase is scene and geo files (-type model in converter), second phase is anim file (-type anim in converter). Editor for some reason does not produce animation files, only standard ColladaConv. I only got max 2012 and the reason I'm using beta 3 is I'm having trouble with the new beta 5 stuff and I'm using a wrapper for another language which only supports beta3, probably a separate post. Either way, if assets were created in beta 3, there should be some concrete steps to produce it again. Maybe my final question is what tool was used in creating beta 3 compatible collada files that the converter can accept. I have no trouble with animations with beta3, it's just that textures are not included, that's all. Every engine, regardless of version should have a successful pipeline conversion steps, in this case it follows an opensource principle, but the thing is, this is the part where it lacks or somebody has trouble converting and using the engine. As always appreciate your help Idris. PS: You can see that there's something thereg when I used the Autodesk FBX converter, which has collada support there. I converted the model and using beta 3 the texture works but without animation. I'm sure the only problem is how the collada structured.